Blue Spring emerges at the base of tall white bluff of Jefferson City dolomite. Recharge Area: Not adequately defined. Presumably the Alton area, to which nearby Morgan Spring has been traced. 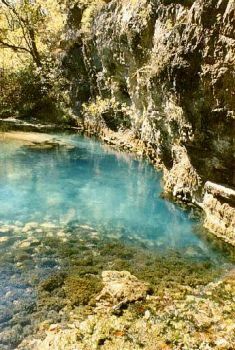 Brief History: Blue Spring is presumed to have been used in the aquaria farming operation in the area until 1978. Its proximity to the Eleven Point River, and frequent flooding probably deterred most efforts. 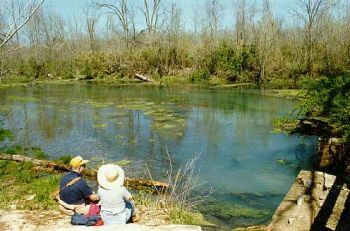 Most of the human use of the area centered at Thomasson Mill (now called Morgan) Spring, about one half mile away. A gristmill operated here in the late 1800's until the early 1930's. The area continued as a local picnic destination. In 1951, the Morgans opened an aquaria plant farm. They continued in business until 1978. Ownership and Access: Purchased by the US Forest Service in 1972. Parking area and river float camp (Road barred: no private vehicle access to springs or camp.) Day use only, except by floaters.